Healthy options always yield healthier results, it truly is that simple. When you make the decision to live a healthier lifestyle it means that you are taking the right steps toward being the best possible version of yourself. The hair on your head is an amazing tell when it comes to how your body is responding to the current diet you may be on. Here are some of the signs that your hair and scalp can give you. Iron or essential fatty acid deficiencies can lead to dry and brittle hair, and can be addressed with milk, yogurt, cheese, eggs and nutritional yeast. You should also be cautious of excessive high-protein diets, which can cause a thick, coarse and wiry texture. In order to achieve a scalp and head of hair that is stronger and healthier make sure your diet is rich with items such as fresh fruit and vegetables, avocados, seaweed and nuts and seeds. Make sure to consult with a stylist from Ottawa’s hair design salon Caralyn’s to ensure your head is on track to be as healthy as it could and should be. Having the perfect hair goes beyond just how clean and well styled it happens to be. 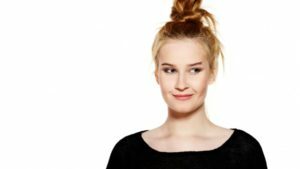 Being unique and having a style that exudes elements of your personality is important, but seeing as how everyone is different you’ll also want to to ensure that your hair compliments the particular size and shape of your face. If you were not born with a sculpted face and the perfect cheekbones, don’t fret! Just give your hair a little change to see an instant effect on your face. Hairstylist Aakriti Kochar suggests opting for side swept bangs instead of going for heavy bangs as they make your face look rounder. You can style your bangs to perfection by curling your hair and leaving the bangs loose on the forehead. Bangs give the face an elongated look and draw attention to the eyes. They are perfect for downplaying the roundness of your face as they add volume and texture to your hair. Curls instantly draw attention away from your face and hide those little flaws. Not all of us have a delicate face and cheekbones that stand out, so for those of us straight hair is a complete no no. Regardless of your face size or shape, you are beautiful! At Caralyns your Ottawa hair salon, our stylists will use these tips to further enhance your personal and unique beauty. It’s important to note that hair doesn’t make the person. However, with that being said healthy and beautifully styled hair can improve your overall look and help boost self confidence. It’s also important to note that not all hair types are created equally; besides thickness, length and porosity levels, the health of any given scalp and how it reacts and affects your hair when oily, dirty, sweaty, etc varies from person to person. Here are some common issues which you may face with your own head of hair, and the best ways to remedy them. If you’ve noticed that your roots are always oily, it could be because you are over washing your hair. When you shampoo too frequently you strip your hair of its natural oils and the scalp believes it must produce more oil as a natural hair protectant. The best way to remedy this issue is to give your hair a little break from shampooing altogether. When you resume hair cleansing, use a scalp cleaning foam first that will help ensure the cleanliness of your scalp and then follow with a shampooing routine (with breaks in between the week). Just because your scalp may not be clearly and immediately visible due to the hair on your head, doesn’t mean that it doesn’t deserve the same amount of attention (if not more) than the rest of your skin when it comes to exfoliating and hydration. The products you use in your hair combined with constant brushing can sometimes irritate the scalp and breakouts and bumps. The best solution is to exfoliate your scalp with a exfoliating scrub at least once a week and make sure you are washing your hair thoroughly as well. 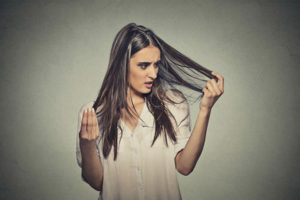 If you ever notice any of these issues or anything else with your hair or scalp that seems out of the ordinary make sure you consult with your Ottawa hair care professional. They will be able to provide a thorough hair and scalp assessment and then offer up the best solutions to ensure you have the healthiest hair and scalp possible. In order to get a good night’s sleep one must begin their slumber at a reasonable time and get at least 8 hours of deep sleep in order to be the best version of themselves the following morning. Of course, this is much easier said than done. Having young children and insomnia are a few of the potential reasons you may be having a difficult time achieving the sleep you need. Whether you are able to sleep well or not on a regular basis (here are some great sleeping tips to consider), there’s a way to ensure that your hair will always look it’s best when you awake. If your hair is long enough for you to sleep with it in the topknot position, you definitely should. “Sleep with your hair up in a topknot: This will keep it from bending during the night and will extend your blow-dry, said the pro. All you really have to do is wash your hair and blow-dry it as usual the night before, then twist it up in circular motions right before bed. Just be sure to secure strands with a few bobby pins or a scrunchie, rather than an elastic band, to avoid any weird creases come morning. By using the topknot method you’ll be able to save yourself some time in the morning when getting ready and keep your hair looking its best for longer. Regularly visiting Caralyn’s, your Ottawa hairstylist will also ensure that your hair is as healthy and beautiful as it can be!